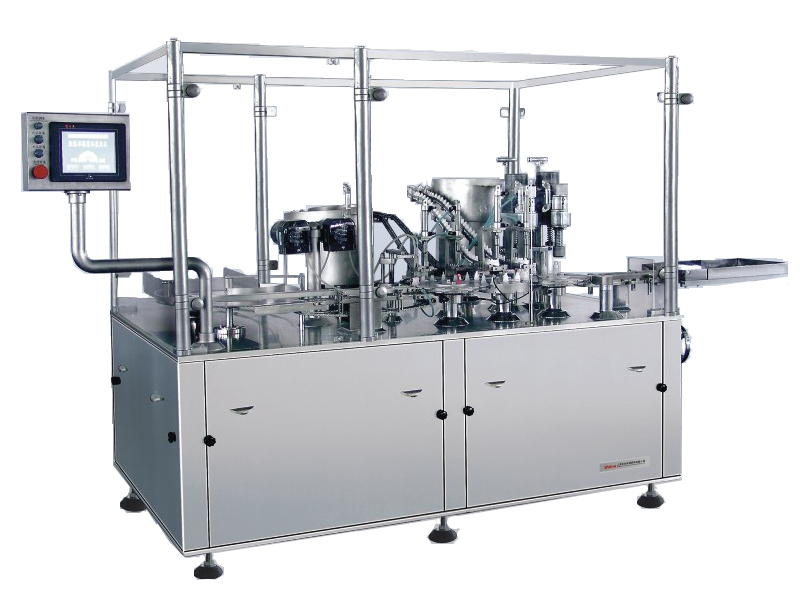 DSG 2/80 eye drop liquid filling, stoppering, capping machine is a mature product for eye drop manufacturing. Computer controlled peristaltic pumps conduct measure filling, and the step number of stepping-motor in the pump in set by the micro-processor. It has many functions of auto filling, auto internal stopper feeding and inserting, auto cap feeding and capping. It’s state of art equipment for eye drop production which complies with GMP Requirement in pharmaceutical industry. l Computer controlled filling dosage, peristaltic filling, easy to operation. l Easy to clean, sterilize, no cross contamination. l Filling dosage could be set without stopping the machine. l No vial, no filling. Filling part has the shrinking function against dripping after filling. l Auto counting and recording and displaying function. l Speed adjusted by inverter. l Cylinder is adopted for stopper auto feeding and cap auto feeding. l Constant torsion cap-screwing, the quality of screwed cap is reliable. Loose capping is avoid. l One machine auto finishes twin needle filling, twin tracks stopper-feeding, twin track cap-feeding and cap-screwing. l 100-class laminar flow protection as option according to the user’s requirements. l Production capacity: 70-80 bottles/min.